1.3.4 Work vs. Heat - which is which? Changes in the state of a system are produced by interactions with the environment through heat and work, which are two different modes of energy transfer. During these interactions, equilibrium (a static or quasi-static process) is necessary for the equations that relate system properties to one-another to be valid. Heat is energy transferred due to temperature differences only. Adiabatic processes are ones in which no heat is transferred. If two bodies are in contact through a thermally-conducting boundary for a sufficiently long time, no further observable changes take place; thermal equilibrium is said to prevail. 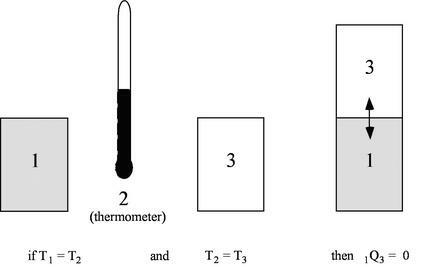 Two systems which are individually in thermal equilibrium with a third are in thermal equilibrium with each other; all three systems have the same value of the property called temperature. The Zeroth Law thus defines a property (temperature) and describes its behavior1.3. Note that this law is true regardless of how we measure the property temperature. (Other relationships we work with will typically require an absolute scale, so in these notes we use either the Kelvin or Rankine scales. Temperature scales will be discussed further in Section 6.2.) The zeroth law is depicted schematically in Figure 1.8. Section 1.3.1 stated that heat is a way of changing the energy of a system by virtue of a temperature difference only. Any other means for changing the energy of a system is called work. We can have push-pull work (e.g. in a piston-cylinder, lifting a weight), electric and magnetic work (e.g. an electric motor), chemical work, surface tension work, elastic work, etc. In defining work, we focus on the effects that the system (e.g. an engine) has on its surroundings. Thus we define work as being positive when the system does work on the surroundings (energy leaves the system). If work is done on the system (energy added to the system), the work is negative. Why is the pressure instead of ? Consider (vacuum). No work is done on the surroundings even though changes and the system volume changes. Use of instead of is often inconvenient because it is usually the state of the system that we are interested in. The external pressure can only be related to the system pressure if . For this to occur, there cannot be any friction, and the process must also be slow enough so that pressure differences due to accelerations are not significant. In other words, we require a ``quasi-static'' process, . Consider . and the work done by the system is the same as the work done on the surroundings. If the process is reversed, the system and the surroundings will be returned to the original states. To reverse the process we need to apply only an infinitesimal . A reversible process can be altered in direction by infinitesimal changes in the external conditions (see Van Ness, Chapter 2). Remember this result, that we can only relate work done on surroundings to system pressure for quasi-static (or reversible) processes. In the case of a ``free expansion,'' where (vacuum), is not related to (and thus, not related to the work) because the system is not in equilibrium. where is the mass of the system. Note that if the system volume expands against a force, work is done by the system. If the system volume contracts under a force, work is done on the system. For simple compressible substances in reversible processes, the work done can be represented as the area under a curve in a pressure-volume diagram, as in Figure 1.11(a). Properties only depend on states, but work is path dependent (depends on the path taken between states); therefore work is not a property, and not a state variable. When we say , the work between states 1 and 2, we need to specify the path. For irreversible (non-reversible) processes, we cannot use ; either the work must be given or it must be found by another method. 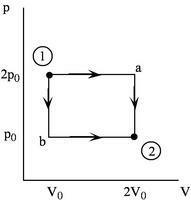 Consider Figure 1.12, which shows a system undergoing quasi-static processes for which we can calculate work interactions as . how you would physically know the work is different along each path. Consider the quasi-static, isothermal expansion of a thermally ideal gas from , to , , as shown in Figure 1.13. To find the work we must know the path. Is it specified? Yes, the path is specified as isothermal. If the water is the system, then the state of the system will be changed by heat transferred from the resistor. If the system is the water and the resistor combined, then the state of the system will be changed by electrical work.